We love a good d'Orsay pump, we think it's one of the sexiest styles in women's footwear. There's just something about the curve on the inside of the d'Orsay that highlights the arch of the foot that screams chic and sensual. Every woman needs a pair of classic stiletto D'Orsay pumps, it compliments everything and works through several seasons. 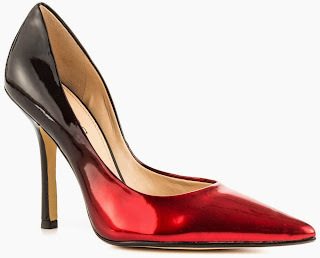 That's why we're loving this Guess Carrie D'Orsay Pump. The above features a stunning a red ombre patent upper, a sleek pointed toe, and a stacked 4" heel. What we're really loving about the Carrie is it comes in a vast array of colors and prints, and retails for $89.99 on www.heels.com.